Harvest Acres is the newest addition to a growing community in Harrisburg, SD. These townhomes are located within a residential community near Liberty Elementary School and several small town businesses. There are no stairs in these single-story, 2-bedroom townhomes, and high-end fixtures, gorgeous faux-hardwood flooring, and huge closets are sure to impress. Each floorplan at Harvest Acres creates a natural flow from one living space to the next and gives each residence an open, livable, and spacious feel. 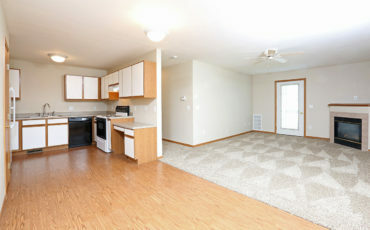 Additional amenities include in-unit washer and dryer and vaulted ceilings. Once you step foot in one of these homes, you won’t want to leave!